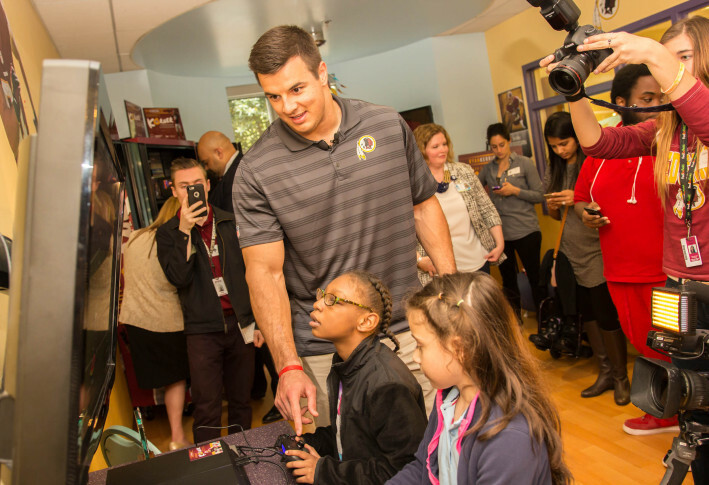 Surrounded by patients and their families, Ryan Kerrigan opened a large locker stocked with tablets, movies, art supplies and video games. WASHINGTON — Young patients of a Northeast pediatric hospital are enjoying a room full of gifts from Redskins linebacker Ryan Kerrigan’s foundation. Surrounded by patients and their families, Kerrigan opened a large locker stocked with tablets, movies, art supplies and video games. Not surprisingly, the kids went straight for the video games. HSC Pediatric Health System is celebrating 130 years in D.C. and now treats 35 inpatients who are diagnosed with both mental and physical challenges. It sees 10,000 outpatient kids a year. Staying on top of treatment trends can be pricey, and many of the foundation’s $15,000 in gifts are meant to be used as therapy tools. When the foundation approached HSC, they asked what the hospital needed most. “We’re able to get some accessible equipment that is highly specialized and hard to find,” said Eva Fowler with HSC Pediatric Hospital. This is his third Kerrigan’s Korner to open at a hospital in the region as part of his Blitz for the Better Foundation. The other two opened at Children’s National and Inova Children’s Hospital. “Kerrigan’s Korner is really the staple of my foundation. It’s a locker designed to make patients’ stay more enjoyable in an otherwise trying time,” Kerrigan said. The gifts were funded partially by the charity and partially by sponsors Menkiti Group and Keller Williams Capital Properties.